Well here we are again continuing to give you even more recipes for you to be able to create your very own lavish afternoon tea. The resurgence in afternoon teas has seemed to also sparked a revival in cupcakes, with bakeries,supermarkets and even cupcake shops springing up all over the place producing all varieties of cup cakes all with there own twist. The recipe I am going to share with you is no exception this chocolate cupcake is topped with a very nice white chocolate cream cheese topping, and will grace any afternoon tea cake stand and taste even better. 1.Preheat the oven to 200c/400F/Gas Mark 6. Put 18 paper baking cases in a 2 bun trays, or put 18 double-layer paper cases on a baking tray. 2.Put the margarine/butter, sugar, flour, in a large bowl and, using an electric hand whisk, beat together until light and fluffy. gradually add the eggs beating well after each addition.add the milk and fold in the chocolate chips.sift in the flour and cocoa powder together. fold into the mixture Spoon the mixture into the paper cases, and smooth the tops. 3.Bake the cupcakes in the preheated oven for 20 minutes, or until springy to the touch. Transfer to a wire rack and leave to cool. 4.To make the icing break the white chocolate into little chunks into a heat proof bowl and set the bowl over a saucepan of gently simmering water until melted .Leave to cool slightly.Put cream cheese in a bowl and beat till soft.Then beat in the slightly cooled chocolate. 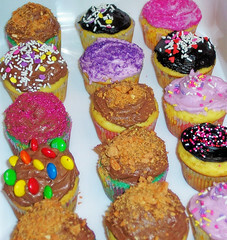 5.Spread a little of the icing on the top of each cupcake and leave to chill in the refrigerator for around 1 hour. Decorate with chocolate curls and enjoy. Various garnishes could be used to decorate depending on the occasion. The world’s largest box of chocolates weighed in at 2,002 lbs. It was made in Chicago, USA, and contained Frango mints.